For a journey from Mostar to Dubrovnik, there are several options to consider depending on your route preferences, budget and time. The cheapest way to travel between these two cities is a bus which costs 107 HRK one way. The quickest way is to drive, which takes just over 2,5 hours if traffic is fine. At the present, there are no trains nor flights from Mostar to Dubrovnik. Mostar and Dubrovnik are connected by at least four daily buses. The journey time is about 3.5 hours, sometimes longer, depending on the route the bus takes and traffic situation, particularly in the summer season. Out of high summer season buses are less frequent, however, there are at least two daily buses (mornings and afternoons) all year around. Typical bus route includes stopping in: Mostar katedrala – Mostar zapad – Mostar istok – Čapljina – Metković – Opuzen – Neum – Ston /Doli / Peljesac crossroads – Slano – Dubrovnik. Some buses from Mostar after reaching Dubrovnik proceed to Montenegro, while in other direction, some buses from Dubrovnik after reaching Mostar proceed to Sarajevo and further to Zenica and beyond. If you travel from Dubrovnik, take a seat on the left side of the bus as from there you will have a great view along the route of the coast, sea and islands. see arrival times of buses from Mostar to Dubrovnik + also see buses from Dubrovnik to Mostar for a journey back. see updated bus schedules at a libertasdubrovnik.hr official webpage. 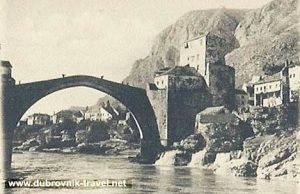 If you would like to visit Mostar on a day trip from Dubrovnik there is a good offer for 59 Euro – see here. There is no train connection between Mostar and Dubrovnik. However, you can get a train as far as Čapljina so if you are train fun, take a train in Mostar and change for a bus from Čapljina to Dubrovnik.